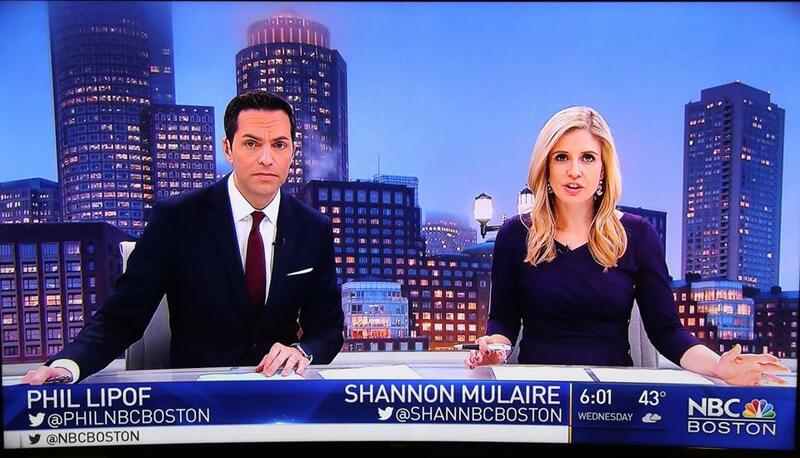 Shannon Mulaire and Phil Lipof anchor the NBC10 Boston newscasts at 6 p.m. and 11 p.m.
Was NBC’s decision to drop Ed Ansin’s WHDH-TV as its Boston affiliate a big mistake? A little more than a year after the bitter divorce, the new NBC10 Boston’s newscasts are struggling to gain an audience, while Ansin’s Channel 7 is often first or second in key time slots. Give Round 1 to Ansin, a billionaire who could have sold his station to NBC but decided to go it alone as an independent. And while the fight is far from over — no one expected NBC10 to be a ratings monster out of the gate — the new station must make significant strides this year, or the locals will really be talking about David taking down Goliath. NBC is owned by Comcast. In the coveted 25- to 54-year-old demographic, WHDH was second only to local leader WCVB-TV (Channel 5) in 2017 in the key time slots of 6 a.m. and 6 p.m., according to Nielsen ratings that stations shared with me. At other times — noon and 5 p.m. — WHDH was number one. NBC10 — officially WBTS-TV — often places last in the ratings among the five broadcast news outlets. One obstacle for NBC10 was the whole business of over-the-air viewers having a hard time getting reception. Most cable subscribers can find NBC on Channel 10, rebranded on Jan. 1 as NBC10 Boston. But over-the-air viewers have had to rescan their monitors to find out which signal worked best: 8.1 or 60.5. On Friday, the network boosted its reach with one more over-the-air option, 15.1, after inking a channel-sharing deal with the public broadcaster WGBH. Ansin may be enjoying good ratings, but he isn’t raking in the revenue he once did as an affiliate. On top of that, his expenses are higher after adding 30 people to staff additional newscasts. With no NBC programming like “The Today Show,” Ansin doubled down on local news, offering 12.5 hours on weekdays, up from 7.5 hours when he was an affiliate. Ansin insists that WHDH remains profitable. “The game plan is working, and we are going to stick with it,” he told me recently. The other winners in the big shake-up have been the legacy stations. WCVB cemented its position as the overall leader among most newscasts in the 25-to-54 demographic favored by advertisers, while WBZ-TV (Channel 4) showed strong gains, particularly early morning (6 a.m.) and late evening (11 p.m.). WBZ president Mark Lund said the disruption in the local market helped his station — which marks its 70th anniversary this year — as viewers gravitated toward the familiar. But the biggest winners of all are the advertisers. With Channel 7 flooding the market with more commercial time slots, prices have been driven down. What can viewers expect in 2018? More jockeying for position. For NBC10 Boston, the time to shine will be in February, when the network will air the Super Bowl (Feb. 4), followed by the Winter Olympics (starting on Feb. 6). With the New England Patriots in the Super Bowl, it’s a given that local TV stations will send a team to cover the game in Minneapolis. Where NBC10 hopes to make a mark is by staffing the Olympics in Pyeongchang, South Korea, with on-air coverage from J.C. Monahan, Brian Shactman, and Audrey Asistio, including a half-hour special. Ellis was among a trio of recovering TV news executives I corralled last year to binge-watch newscasts and offer feedback on the new NBC station. Gluttons for punishment, they agreed to do it again. Ellis said NBC10 still hasn’t found its groove, while WHDH has kept up the pressure. The problem with the NBC10 newscast is that it’s not as flashy as WHDH’s or Fox’s WFXT-TV’s (Channel 25) and doesn’t have the gravitas of the programs at legacy stations WCVB or WBZ. Before its launch, NBC10 poached well-known meteorologist Pete Bouchard from WHDH and later brought in Monahan as an anchorwoman after she left WCVB. Matt Noyes also came over from New England Cable News (also owned by Comcast) as its chief meteorologist. The evening anchor team consists of lesser-known talent Shannon Mulaire and Phil Lipof at 6 p.m. and 11 p.m.
On Monday, NBC10 made more changes to its lineup, bringing over longtime NECN anchor Latoyia Edwards to helm the newscasts from 4 a.m. to 7 a.m. The biggest criticism from Lu Ann Reeb, a former executive producer at WBZ, and Alan Schroeder, a former television producer, is that NBC didn’t try to reinvent the local newscast. “There was an opportunity to produce something different,” said Reeb, who now teaches entrepreneurship at Emerson College. Like newspapers, local TV stations are struggling to stay relevant as people get more of their news online. A recent Pew Research Center report showed that the portion of Americans who often rely on local TV for their news fell to 37 percent in 2017 from 46 percent in 2016. TV news may seem all the same, but not to Boston viewers. This will be a make or break year for NBC10. It's time to step up or be tuned out.